For the past seven years, the City of Vancouver has been forging the way in providing sustainable transportation options to its citizens, including working towards a complete AAA (‘All Ages and Abilities’) bicycle network. Throughout all the trials and backlash, the surrounding suburban areas have been watching and waiting to see if Mayor Gregor Robertson and Vision Vancouver would suffer politically for their actions. After three successful election campaigns, it’s clear – despite pushback from a vocal minority, the people of Vancouver like how their city’s transportation model has changed towards a multi-modal system. We’ve spent years telling the stories of how Vancouver’s changes have benefitted families like our own, so it seems prudent to turn our attention to the neighbouring suburbs. While some new parents make the decision to remain in the dense, walkable areas likes Commercial Drive and Mount Pleasant, many still opt to uproot and move to places like North Vancouver, New Westminster and Surrey for more affordable housing, many times sacrificing their transportation choices in doing so. At least we thought that was the case. Upon speaking to leaders in these cities, we were pleasantly surprised to hear about work quietly taking place ‘under the radar’ to move away from car-dependency. Progressive mayors and councils have long recognized that the car-centric model of previous decades is unsustainable, which explains why 20 of 23 councils were in strong favour of a ‘yes’ vote in the recent plebiscite. The Metro Vancouver region will be experiencing exponential growth in the next 30 years. It is imperative that all districts and cities, not just Vancouver, develop transportation models that support all modes. When it comes to cycling, the interest is already there for many in the region, and happens to be one of the easiest ways to transport people from their homes to transit hubs, shops and employment. 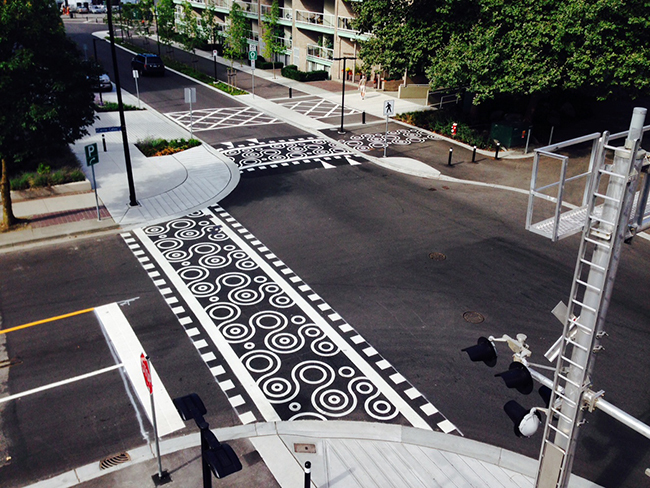 So just what are some of our suburbs doing to retrofit their streets for the bicycle? New Westminster Mayor Jonathan Cote (Image: Modacity). As the region’s oldest incorporated municipality, residents of New Westminster are very proud of their city. 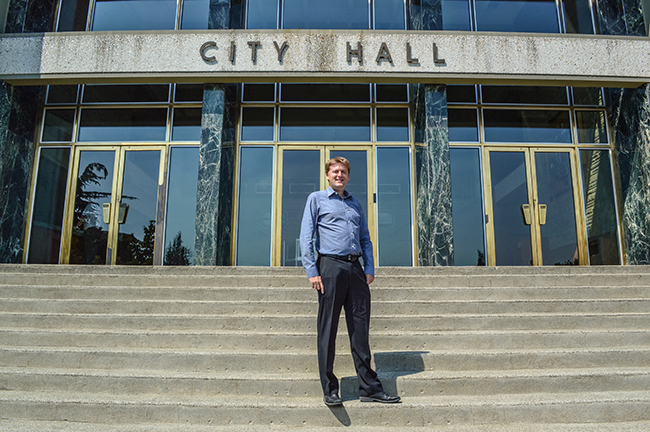 For first term Mayor, Jonathan Cote, selling the idea of reducing automobile traffic on their streets was not a difficult task. “For the most part the community gets that if you widen roads, you invite more cars”, said Cote. In the region, the City of New Westminster is just second to the City of Vancouver when it comes to public transportation usage, with 28 per cent mode share. With this in mind, they are well positioned to really embrace sustainable transportation. Before taking on his role as mayor, Cote sat on city council for three terms, and worked to develop a more comprehensive bicycle plan for the City’s 2014 Transportation Master Plan, adopted in early 2015. The plan included cleaning up the existing bike map, made up of a complex and confusing quantity of bikeways and recreational paths, and focusing more on establishing quality east/west and north/south connections. Ultimately, the goal is to create a more complete network that not only serves commuting cyclists, but also those making more short distance trips (the city spans less that five kilmetres in each direction). One of the most exciting projects happening at the moment in New Westminster is the redevelopment and re-envisioning of its waterfront. The goal is to improve walking and cycling access to the Fraser River esplanade – a bold move considering the most recent change has involved tearing down a portion of the Front Street parkade. Westminster Pier Park (Image: Modacity). The Westminster Pier Park is a perfect representation of how cities can reclaim space and make it welcoming for people of all ages. It includes a multi-use pathway that will eventually connect Braid Station to the east with 22nd Street Station to the west. 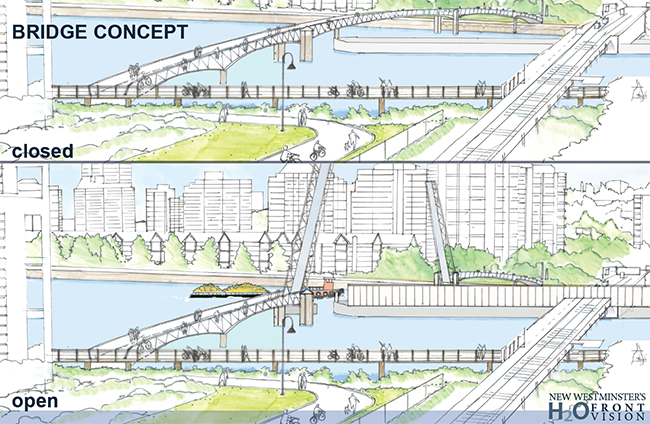 Cote is also forging ahead with an exciting project to build the Q2Q Bridge – a pedestrian and bicycle only bridge that will connect downtown Quayside to Queensborough. The Proposed Q2Q Bridge (Image: City of New Westminster). 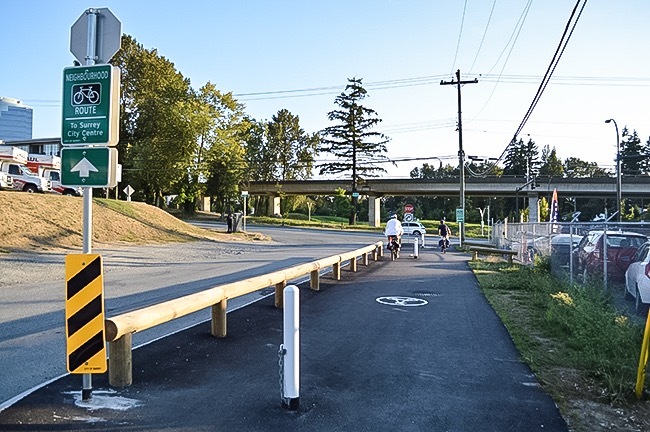 The long-term vision for the City of New Westminster and Mayor Cote is to improve options for multi-mobility to its residents, and provide a continuous connection to neighbouring municipalities, helping to build a more comprehensive regional bicycle network. As that plan unfolds, we are excited to make the trek along the Central Valley Greenway from our East Vancouver home to Pier Park, and enjoy all the wonderful work they are doing there. 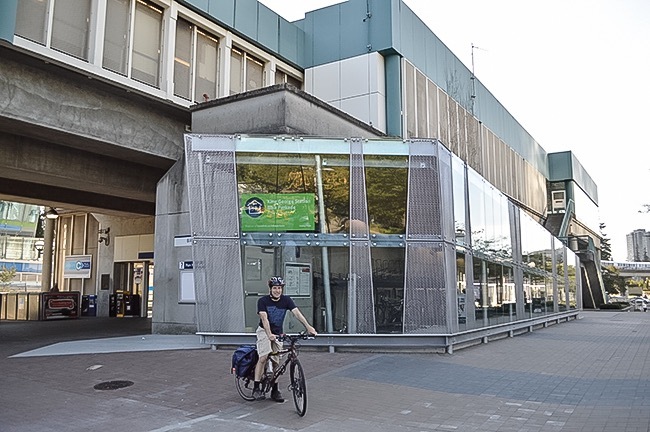 Surrey HUB Co-Chair Tim Yzerman Shows Off the Bike Parkade at King George Station (Image: Modacity). Directly across the Fraser River, the City of Surrey is facing its own unique challenges (geographically, it is larger than Vancouver, Burnaby and Coquitlam combined), but is moving forward with a consensus-based approach that has brought many unlikely partners to the table. The city’s 2012 Cycling Plan – which was drafted using community input and representatives from Fraser Health, HUB, SFU, HASTe, ICBC, RCMP, and various Business Improvement Associations – maps out the next 20 years of biking improvements needed across the city, including an extensive Greenway Network. Within this plan, there is a distinct focus on getting more kids on bikes, which starts as simple as considering the various schools, community centres, and other places children frequently visit when selecting routes Furthermore, Surrey is the only Metro Vancouver municipality that has committed to providing HUB commuter bike education in all of its elementary schools. 87 of 99 local schools took advantage of the funding available to hold cycling skills classes for grade two and three students. As a result, Surrey boasts Bike to School Week participation levels that are almost equal to those in Vancouver, with every indication they will overtake them in 2016. This long view has engaged countless members of the community, and runs contrary to the more “top down” approach we’ve seen in the Vancouver. As local HUB chair Gord Hall explained, it also gives Surrey an edge over its municipal counterparts when applying for federal and provincial infrastructure funding. Neighbourhood Bike Route in Surrey (Image: Modacity). City of North Vancouver Mayor Darrell Mussatto (Image: Modacity). Of all the cities we visited, none was more surprising or more refreshing than the City of North Vancouver. Long known for its world-class mountain biking, we had little knowledge of the bike lanes and pathways that have been developed in recent years. 13th St. 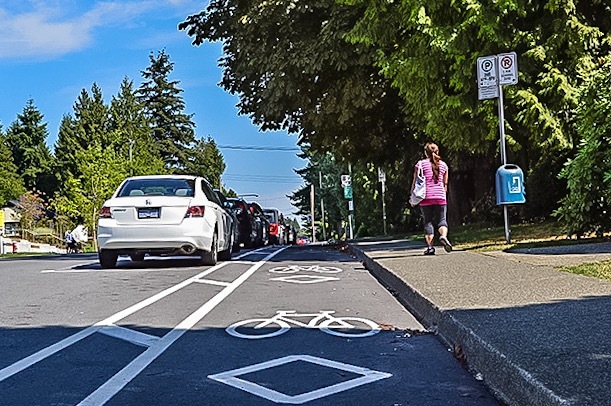 Protected Bike Lane, City of North Vancouver (Image: Modacity). But Mussatto is determined to move the City of North Vancouver towards the future of transportation, even at his own cost. This month, he is travelling to Trondheim, Norway, where developers have built a “Trompe”, or bicycle lift, all at his own expense. With the much of the City’s topography boasting some very steep hills, the hope is that by adding this technology to current and planned infrastructure, it will remove barriers to bicycle travel for the “interested but concerned”. Outside of the bicycle lift and protected bike lanes, the largest and arguably most substantial project nearing completion is the Spirit Trail. With an end goal of linking Deep Cove to Horseshoe Bay, this expansive separated pathway is the jewel of the City of North Vancouver’s waterfront, also currently under redevelopment. Detail of the Spirit Trail (Image: City of North Vancouver). 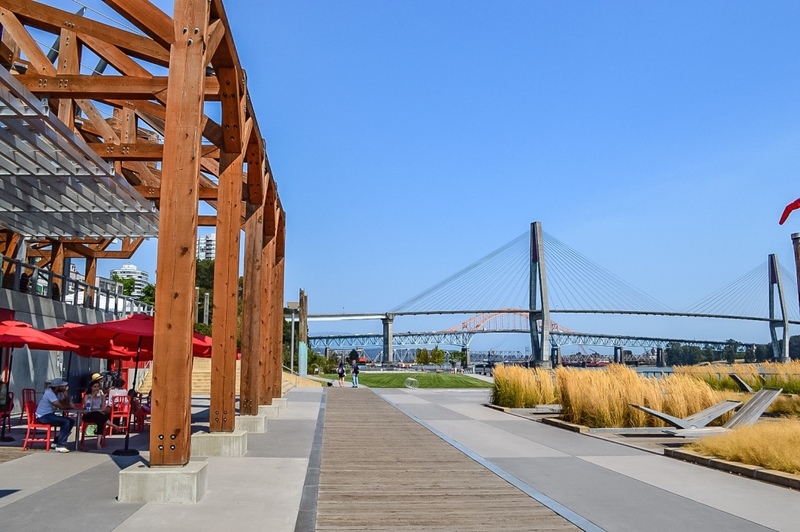 The City has worked closely with both the Districts of North and West Vancouver, as well as the Squamish First Nations to finally connect the waterfront pathway, including a new bridge over Mosquito Creek, and another over the previously dangerous intersection at Lower Level Road and 3rd Street. This project will serve as Mayor Mussatto’s legacy, and will surely attract not only tourists, but new residents flocking to live in a place that is providing them with a variety of enjoyable transportation options. 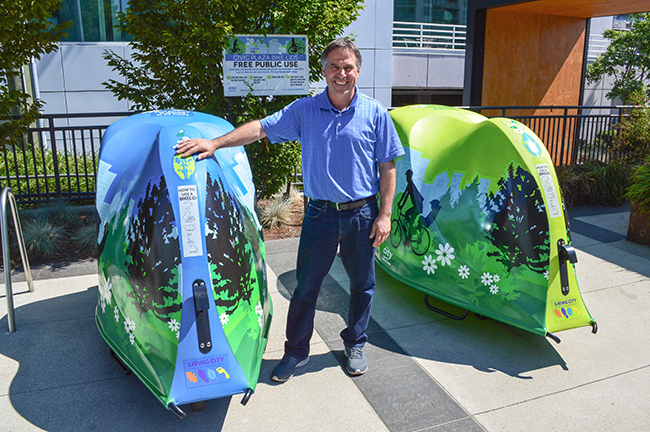 “I want to make it so future generations can live in a dense environment, and residents and visitors can pick up a bike that will pretty much take them anywhere they want to go,” explains Mussatto. From what we can see, that future is very near. Waterfront cities around the world will soon be looking to the City of North Vancouver as a shining example of how to combine living, work and play in a way that is accessible to everyone from 8 to 80. Throughout all of our discussions with the various municipalities in our region, one thing is certain – retrofitting our streetscapes to incorporate other modes of travel beyond the private automobile is not just a ‘big city’ idea. Nor can it be if we are to remain one of the most desirable regions in the world in the coming years. If all of the plebiscite rhetoric taught us just one thing, it’s that this region is growing – fast. While the City of Vancouver is continually building to adapt to this influx; dense, urban life is not everyone’s cup of tea. Many who flock to the Metro Vancouver still want a single-family dwelling in a quieter neighbourhood. That does not mean they should also be locked into a lifetime of sedentary travel. Not simply for their own health, but for the health of our environment. True cities of the future, both urban and suburban, must offer multi-modal options that allow people the choice to leave the car at home, or even go without car ownership altogether. For bicycles, our experience has been that they provide the easiest means to complete the ‘last mile’ – that end of trip distance from public transportation. They are a quick way to make that jaunt to the corner store, rather than burning a gallon of gas to buy a gallon of milk. And for our children, they are a healthy and active way to begin and end their school day, something generations before may have taken for granted. While we only spoke to three of our 23 municipalities, we know that many others have already recognized the need to move to a more sustainable transportation model. Lack of reliable funding is currently the biggest barrier, but they are doing what they can to forge ahead. We are thrilled to see how these welcome developments will change the face of Metro Vancouver, and help maintain our status as a healthy, happy, beautiful and livable region.